I always find that when I take the time to stay organized I’m in a better mood, can think clearer, stress less, and save money. The other thing I’ve noticed is that organization begets organization. For instance last week the girls and I went through all of their clothes, throwing away some and bagging up the others for a yard sale. The rest were organized and neatly put away based on the type. Then on Friday I cleaned out my car. By Saturday I was ready to tackle our big problem: toys. It took me about four hours and (embarrassingly) six trash bags full of junk and two bags full of “sell” stuff. It was so awesome to be rid of all the junk that gets handed to my daughters. It feels so good to have everything organized. It saves me time, money, and even helps me earn more! 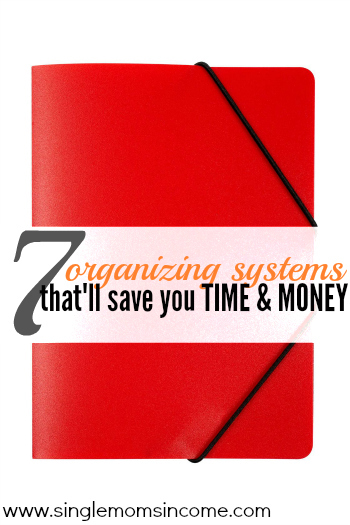 So, today I wanted to share with you the organizing systems that I use. Normally I don’t track my spending. That’s because I choose to live a low cost lifestyle and my bills don’t really fluctuate. I have the same expenses month in and month out. However, when I’m in a season of life like I’m in now, where my income and expenses are starting to fluctuate (more income, more taxes, less babysitting, more school related costs, etc.) I start to get overwhelmed. That’s when I turn to my super simple budget spreadsheet to track my spending. My favorite budget spreadsheet is the “Family Budget Planner” template from Microsoft Excel. (And I have tried A LOT of budget spreadsheets.) It’s nothing fancy which makes it perfect. You simply input you’re incoming and out goings and the spreadsheet will calculate everything for you. When I went from eating out all the time to going completely cold turkey a simple menu plan is what did the trick! But when I decided I wasn’t going to succumb to drive thru madness anymore I knew I had to make a plan. Every week I just rip out a sheet of notebook paper and come up with seven dinners based on the food I already have. 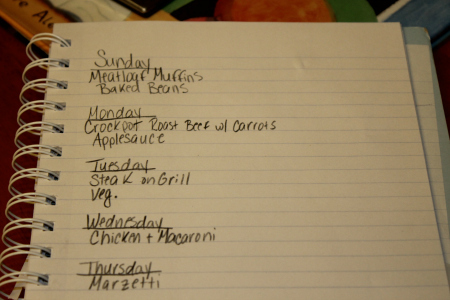 I try to plan things for specific days (like crockpot meals for busy days) but I am totally flexible. I can look at my meal plan and just choose something off of the list. I love pinning easy recipes and crockpot meals so that I can put some variety into our meal plan. I’ve also been pinning DIY solutions to common household problems, cleaning solutions I want to remember, and so much more. Pinterest is actually a great site for pinning all those resources you want to remember and can greatly help you with your menu planning. I got my coupon holder way back when extreme couponing was the thing. I hated the thought of carrying a big, bulky binder around and my coupon envelope was the perfect solution. I’m not an avid couponer but you better believe if I have a coupon for something I plan on buying I’ll use it. (I’ve actually been trying to use more coupons lately.) My coupon holder fits nicely in my purse and is very convenient. is currently around $10 and looks a lot more sturdy than what I have. 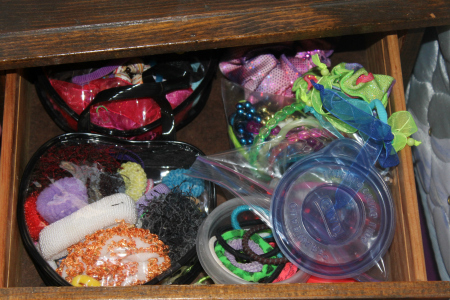 To keep all my receipts and bills organized I have designated drawer in my coffee table. I just toss everything in there and then about once a week I’ll go through and record all of my expenses and file my paid bills. As far as bills go I have a filing system I’ve been using for a couple of years that I love. I have an expandable twelve pocket briefcase folder and each folder is labeled with a month. I put all my bills for the month in their designated spot. When I come back to that folder (12 months later) I shred all of the contents and start over. Important documents go into file folders in my desk. Regularly decluttering and keeping your house organized can save you a lot of money. Especially when you’re buying doubles of things you already have. I’ve done the same thing with thermometers too. 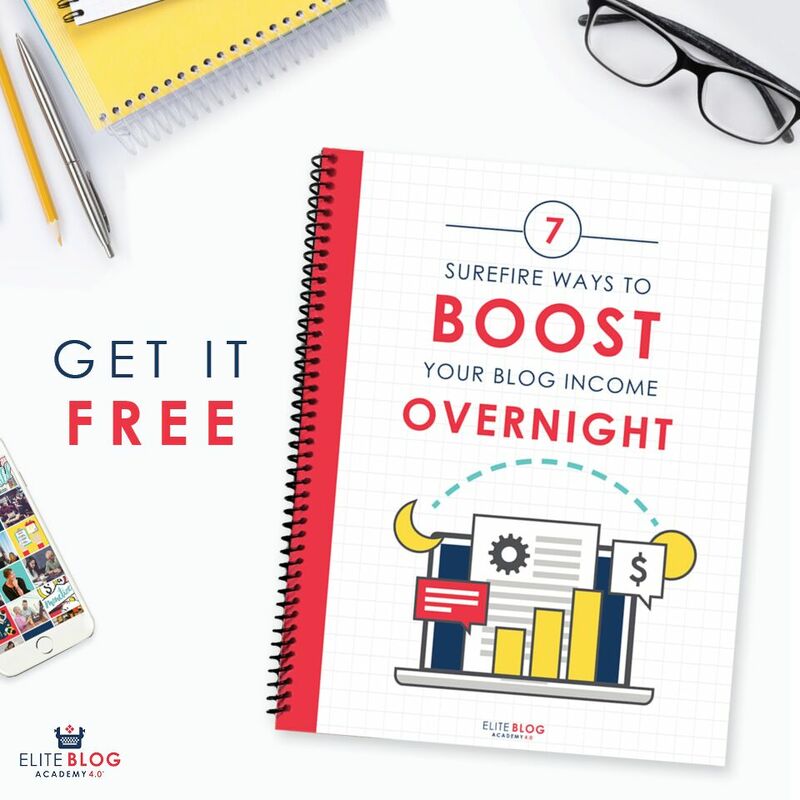 Keeping up with it all can seem overwhelming – but it’s really not. If you spend twenty to thirty minutes a day going through your stuff and remember to put stuff back where it came from, then it’s not hard. What’s overwhelming is waiting too long and having eight trash bags full of junk to get rid of. Am I right? 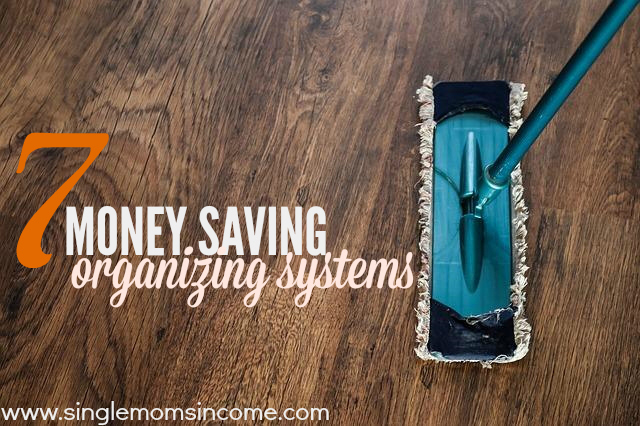 Do you have any special systems for keeping your home and finances organized? Well I decided to have a budget only 2 years ago and inthis time I changed jobs several timees, accepting and working on side hustles to increase my savings (to achieve personal finance goals), usually I write daily my purchases and once per week I have my budgeting day where I do so many adjustments every time to have a good balance between everything…and I am not still married or with kids…so probably inthe future with a family my headaches will be more:P I think your method is quiet good!!! My best ” tip” is to always have a box set up for Charity / Gooddwill. If possible, keep it near the laundty area. As I fold clothes, I look for items that no longer fit and put them straight in the box. When the box is full it is time to go dump it off. I agree it’s easier to stay on top of things than to catch up, but I couldn’t spend half an our a day organizing! But, I actually kind of enjoy getting a few hours blocked off to tackle a big purge once in a while. It feels so good when I’m done. The house doesn’t look too cluttered now, but there are pockets of SO MUCH STUFF that I still need to get to. Thanks for sharing how to keep everything together. I love to menu plan! It saves me so much time. I take about 20 minutes every Sunday to map it out and then I go shopping for every thing I need. I no longer waste time everyday trying to figure out what to eat. I am in the midst of doing a huge declutter and it is great to get things organized. I just feel so “light.” Do you know what I mean? The budgeting part just doens’t work for me… Almost every month I do the budget and I plan on sticking to it and I do… for 2 days max. I need to find a way to actually stick to it for longer instead of forgetting about it almost instantly! One word- CASH. My husband and I thought we didn’t need to listen to Dave Ramsey types who say “cash only” but our pay has been cut pretty drastically recently and something had to give. So we gave the old envelope system a try. Never have I felt so light and free with regards to money! It’s amazing! I don’t check my bank balance twice a day to make sure I have enough to cover the bills. I just use my gas money for gas and my food money for food and my household money for stuff and when it’s gone, it’s gone. I’m done spending until payday. Known exactly how much I have to spend helps me plan my days better and I’m more content to stay home and work on projects that I might ignore if I could pretend I had money to spend on frivolous stuff. I am visiting from Frugal Friday Link Up Party. Awesome post. I love all the organization tips. 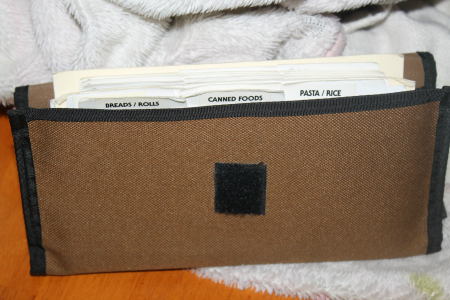 I also plan meals using a piece of notebook paper and what I have in my stock pantry. I thought I wasn’t a Pinterest type person either until I read this article about this person who used Pinterest to make a resume board, which seemed awesome to me and a much better representation of my skills in the arts than a regular PDF document. But once I signed up, I got completely sucked in. I love your no-nonsense meal plan – simple is best. I am a fribrowarrior of five years (suffer from fibromyalgia). I have been struggling to keep on top of house work, meal planning etc as I never know which days are going to be good days and which will not. However I’ve decided that 2015 I will begin to make simple meal plans and set a budget plan, house cleaning rota and declutter cycle. It sounds very ambitious to me……lets see how I get on. I am a fibro warrior as well so I know what you mean and I am starting off 2015 the same way you are! May I ask what are some good coupon websites? Or how can I get coupons? I check Hip2Save.com a lot when I’m looking for coupons. It’s a very helpful website! I find keeping up with it all can be tricky, but I like the processes you’ve suggested here. Will give them a try!